Studies have identified mutations in >55 genes that cause steroid-resistant nephrotic syndrome (SRNS) and localized SRNS pathogenesis to podocytes. The authors previously reported that individuals with mutations in COQ6, a coenzyme Q (CoQ10, CoQ, or ubiquinone) biosynthesis pathway enzyme, develop SRNS, and demonstrated that CoQ can reduce kidney dysfunction. 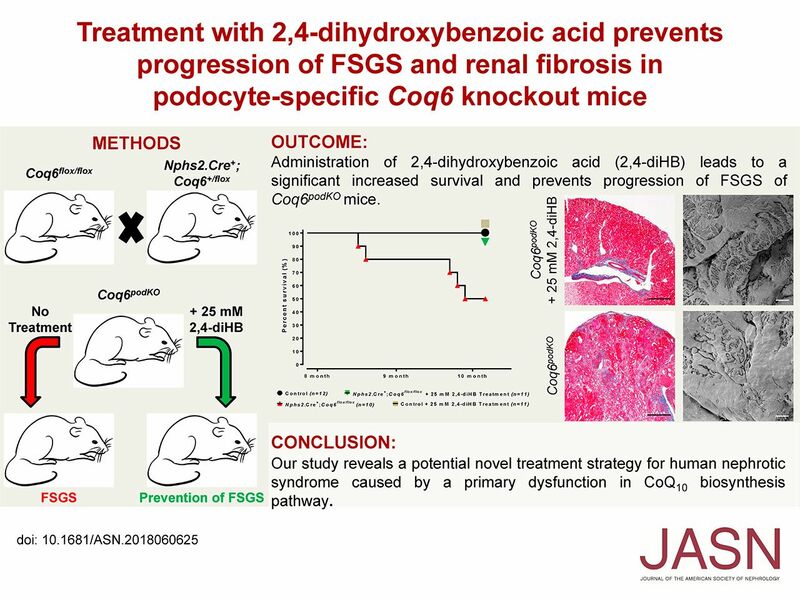 In this study, they generated a podocyte-specific Coq6 knockout mouse and showed that abrogating Coq6 in mouse podocytes caused FSGS and proteinuria. In vitro studies revealed an impaired podocyte migration rate in COQ6 knockdown human podocytes. Treating affected mice or cells with 2,4-dihydroxybenzoic acid, an analog of a CoQ precursor molecule, prevented renal dysfunction and reversed migration rate impairment. This suggests a potential therapeutic approach for those cases of human nephrotic syndrome that result from a primary dysfunction in the CoQ10 biosynthesis pathway. Background Although studies have identified >55 genes as causing steroid-resistant nephrotic syndrome (SRNS) and localized its pathogenesis to glomerular podocytes, the disease mechanisms of SRNS remain largely enigmatic. We recently reported that individuals with mutations in COQ6, a coenzyme Q (also called CoQ10, CoQ, or ubiquinone) biosynthesis pathway enzyme, develop SRNS with sensorineural deafness, and demonstrated the beneficial effect of CoQ for maintenace of kidney function. Methods To study COQ6 function in podocytes, we generated a podocyte-specific Coq6 knockout mouse (Coq6podKO) model and a transient siRNA-based COQ6 knockdown in a human podocyte cell line. Mice were monitored for development of proteinuria and assessed for development of glomerular sclerosis. Using a podocyte migration assay, we compared motility in COQ6 knockdown podocytes and control podocytes. We also randomly assigned 5-month-old Coq6podKO mice and controls to receive no treatment or 2,4-dihydroxybenzoic acid (2,4-diHB), an analog of a CoQ precursor molecule that is classified as a food additive by health authorities in Europe and the United States. Results Abrogation of Coq6 in mouse podocytes caused FSGS and proteinuria (>46-fold increases in albuminuria). In vitro studies revealed an impaired podocyte migration rate in COQ6 knockdown human podocytes. Treating Coq6podKO mice or cells with 2,4-diHB prevented renal dysfunction and reversed podocyte migration rate impairment. Survival of Coq6podKO mice given 2,4diHB was comparable to that of control mice and significantly higher than that of untreated Coq6podKO mice, half of which died by 10 months of age. Conclusions These findings reveal a potential novel treatment strategy for those cases of human nephrotic syndrome that are caused by a primary dysfunction in the CoQ10 biosynthesis pathway.